Matt Watroba at Barefoot Productions! One Night Only! 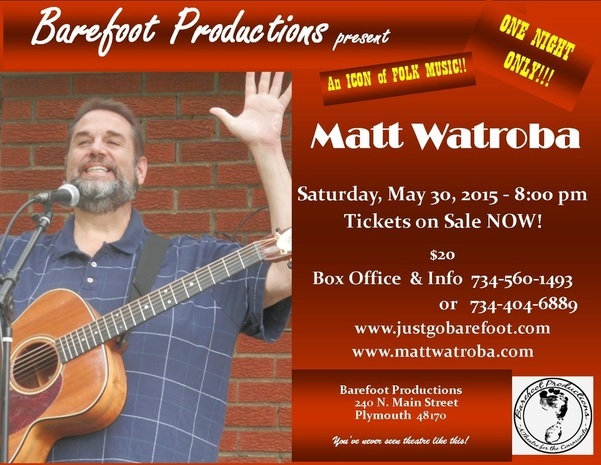 Barefoot Productions is proud to bring you an evening of music with Matt Watroba. Matt was awarded “Best Overall Folk Performer” by the Detroit Music Awards for the year 2000. His long list of credits include the prestigious Ann Arbor Folk Festival, the Detroit 300 celebration, The Ark, the Spirit of the Woods Festival, the New Jersey Folk Weekend, Lousiville’s Kentucky Music Weekend, the Swannanoa Gathering in North Carolina, the Fox Valley Folk Festival, as well as hundreds of school and community presentations throughout the Great Lakes Region. He has shared the stage with some of our greatest performers including Pete Seeger, Tam Paxton, Ramblin’ Jack Elliott, Arlo Guthrie, Shawn Colvin, Christine Lavin, Peter Yarrow, and Richard Thompson. Matt was formerly the radio host for "Folks Like Us," a position he held for over 20 years on WDET-FM (Detroit). It's an evening you won't want to miss! !